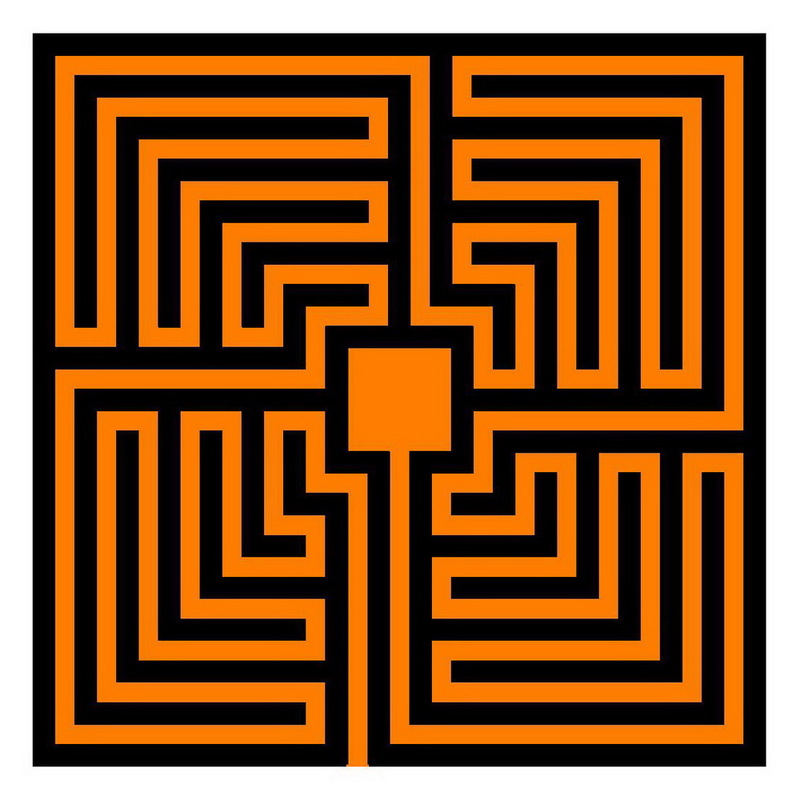 The first big change in the labyrinth figure happened in the time of the Roman empire of about 165 B.C. till 400 A.D. Before, for nearly two millenniums only the classical, sometimes called Cretan type, was used. The Roman type is marked by the division in (mostly four) sectors / quadrants /segments which are completed one after the other, before entering the middle. Besides, the alignment and the external form can be different. 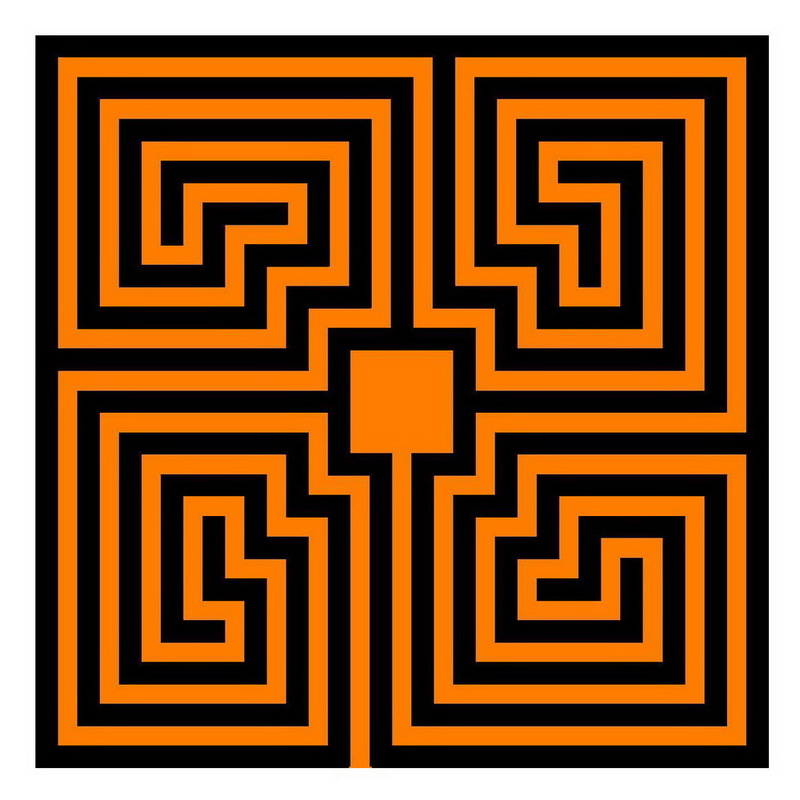 Jeff Saward has explained in one of his books how one can picture the development of the Roman labyrinth from the Classical one, which I tried to reproduce in a previous posting (see below). 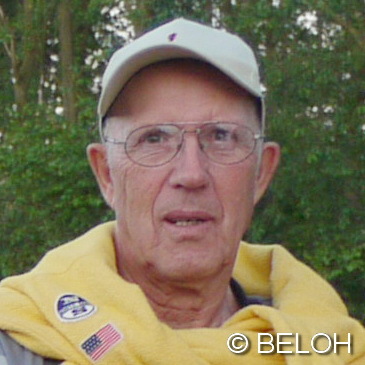 The following subdivision in three big groups is also from him. Here, I only want to explain it nearer. The external form or the number of the circuits is not so important for the differentiation of the various groups. The kind of the alignment is what counts. We have nine circuits. One is used for the circumnavigation of the center and one to change to the next sector. 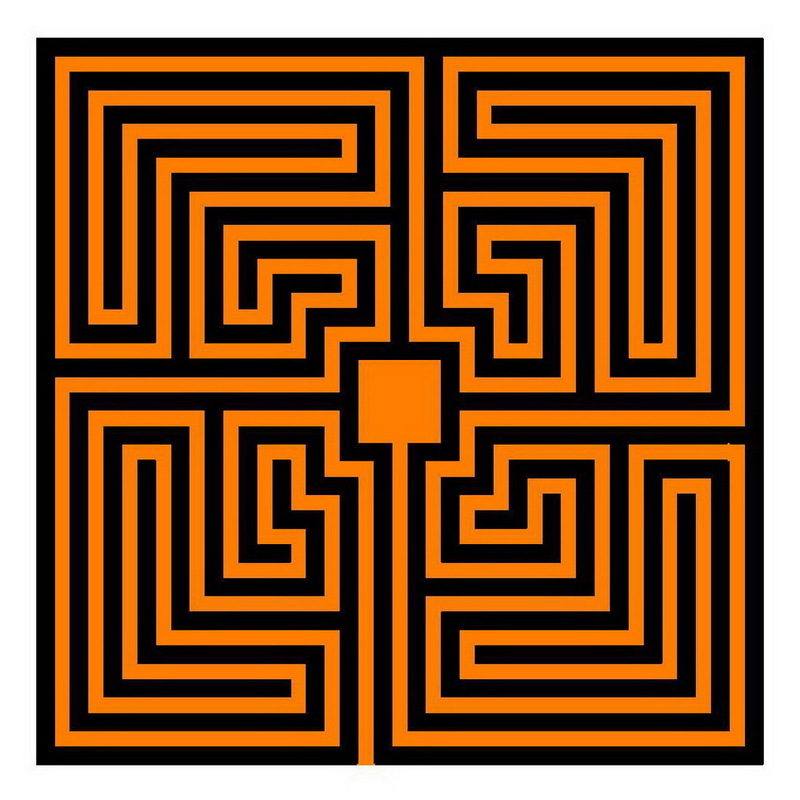 The inner seven circuits are identical with those in the classical labyrinth. One can see clearly the two meanders. One would have to call this type more exactly two-meander-type or more-meander-type. Since there are still other samples, made with more meanders. The next type is called spiral-type. It is less complicated and has only one change of direction within each sector. The spiral movement is caused by a meander. The principle of the alignment is identical with the one in the previous type, even if there are all together less circuits. Strictly speaking one would have to call this type one-meander-type. Since the spiral is nothing else than a meander. In the serpentine-type the way inside the sector simply wiggles to and fro. In this type it is quite easy to append more or less circuits. 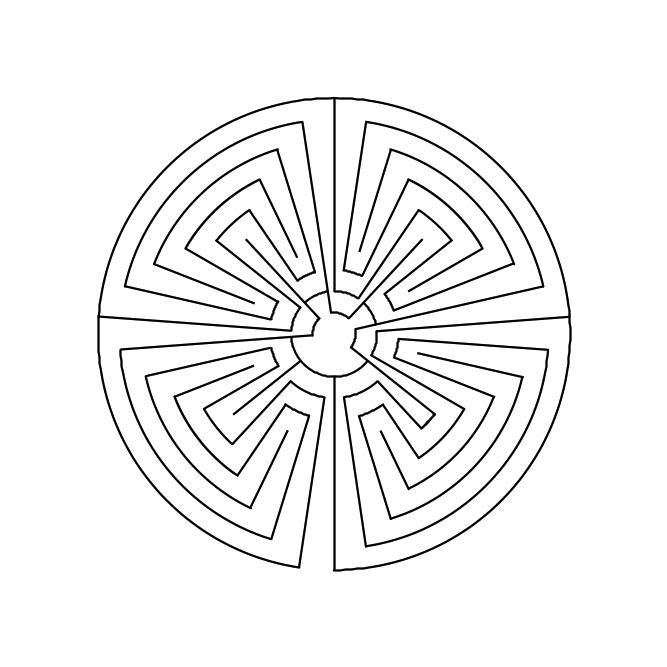 The historically known Roman labyrinths can be sorted with some variations into these groups. And according to these criteria can be thought another immense number of variations. Since it does not depend on the external form (angular or round) or the number of the sectors. 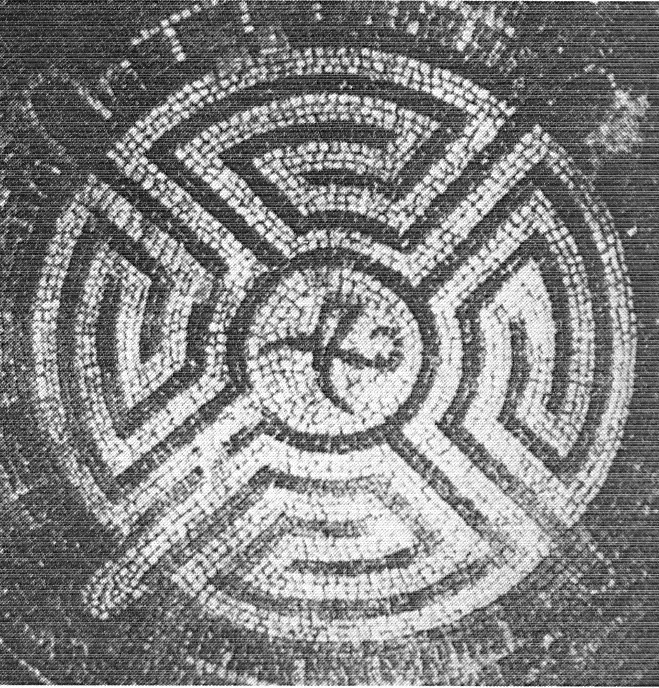 The original historical labyrinths were often mosaics and served more decorative purposes. Nowadays the labyrinths are mostly put on as walkable objects. There would be still a rich sphere of activity. Since the most frequent new labyrinths are either the classical type or the medieval Chartres type. Recently I had the following task: To (let) mow a labyrinth in a meadow. It was a rectangular piece of about 10 m width and 50 m length beside the football ground of a school. Within sight to the Schwanberg. 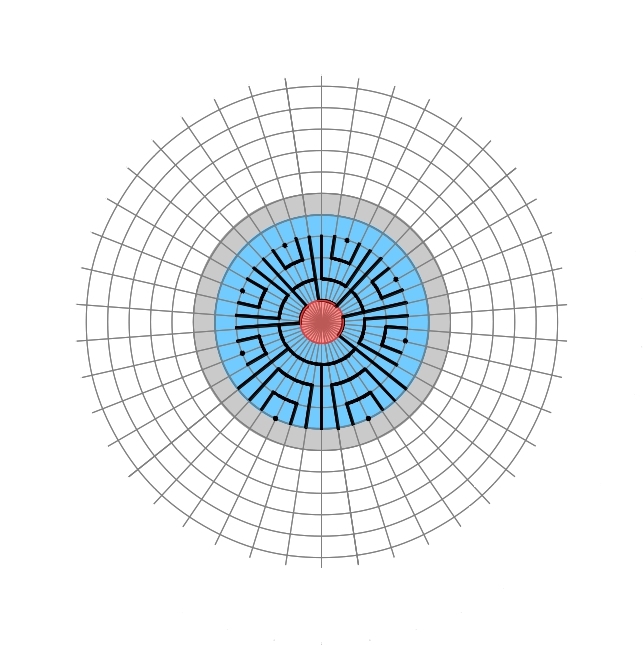 First I wanted to make a circular labyrinth, because I had already some drafts for it. 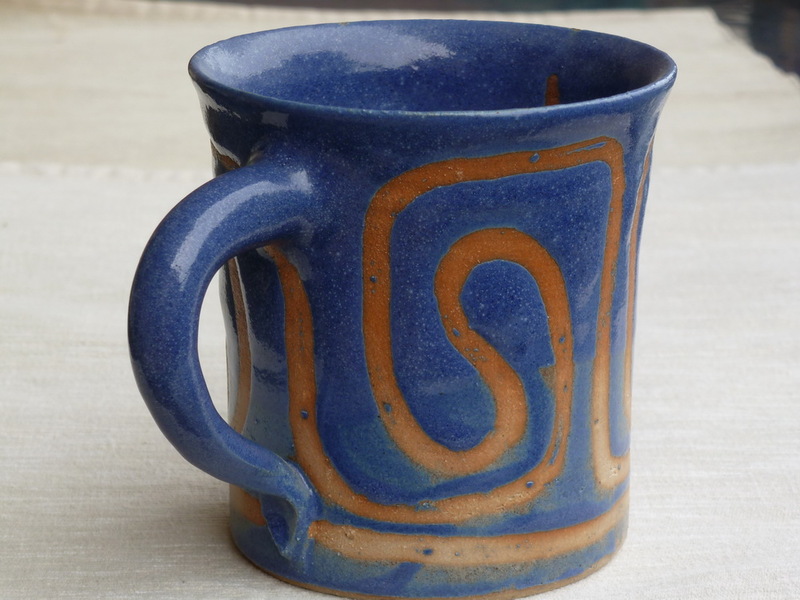 But then my look fell at the labyrinth cup in the bookshelf with the Schwanberglabyrinth on it. If that fitted on a cup, why not also in a rectangle? 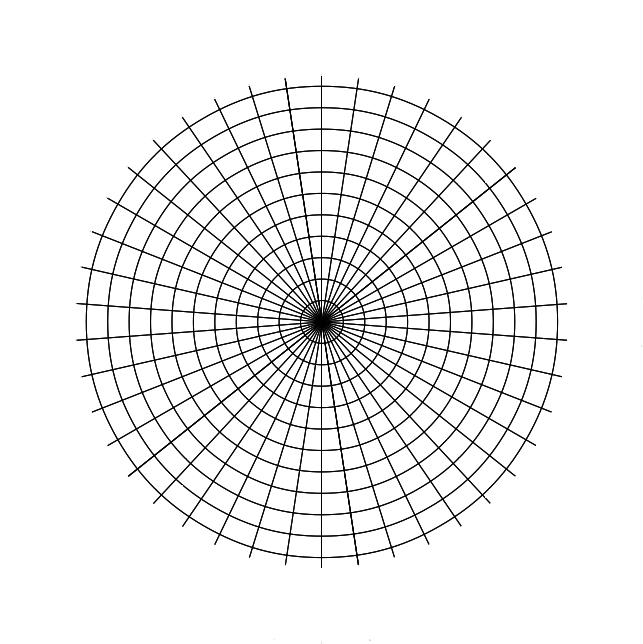 The center must not always be in the middle (from a circle). And thus I tried on a sheet of paper and soon had my draft. Not mathematically exact as I make this normally, but simply freehand. The Schwanberglabyrinth is a Roman sector labyrinth (type Avenches) which is circled once. It is made of four meanders which are lined up. The passages can be devoured very smoothly into each other. One has this rhythm in the blood if one has dealt long enough with the labyrinth. With the sheet of paper in the hand I marched before the lawn mower guided by a gardener of the city of Dettelbach, and thus this labyrinth came about. As a movement figure for the children in the break.